The "Gawain Poet", or less commonly the "Pearl Poet", is the name given to the author of Sir Gawain and the Green Knight, an alliterative poem written in 14th-century Middle English. Its author appears also to have written the poems Pearl , Patience, and Cleanness; some scholars suggest the author may also have composed Saint Erkenwald. Save for the last (found in BL-MS Harley 2250), all these works are known from a single surviving manuscript, the British Library holding Cotton Nero A.x. This body of work includes some of the most well-regarded poetry written in Middle English. The Gawain Poet remains unidentified. Some scholarship has argued to assign the poem to one John Massey, a member of the landed gentry from Cheshire. This attribution of the poems of Cotton Nero A.x is not widely accepted, however, reflected in the ongoing use of the labels "Pearl Poet" or "Gawain Poet". The language of the poems shows that the poet was a contemporary of Geoffrey Chaucer, John Gower, and William Langland, who are sometimes (following the suggestion of academic John Burrow) collectively called the Ricardian Poets in reference to the reign of Richard II of England. All four poems of the Cotton Nero A.x manuscript are in the same Middle English dialect, localised to the area of north-western Staffordshire and south-eastern Cheshire, in the English Midlands. This may merely indicate the dialect of the scribe responsible for copying the poems, but there is good evidence that the dialect of poet and scribe were very similar. It is, therefore, thought most likely that the poet was a native of east Cheshire or west Staffordshire and was writing in the latter part of the 14th century: based particularly on the narrative voice of Pearl, the poet is thought to have been male. Internal evidence indicates that all four works were probably written by the same author, though their similar dialect and presence in the same manuscript have usually been taken as the strongest evidence of common authorship. 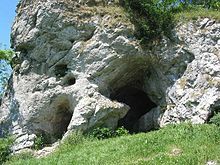 The caves at Wetton Mill, near Leek, Staffordshire, have been identified as a likely inspiration for the "Green Chapel" in Gawain and the Green Knight, given the author's dialect and the geography indicated in the poem. The author began writing during a time of rapid change and development in English literature. The poet's language was arguably also influenced by 14th-century social developments, particularly the movement toward a more anglicised ruling class and political identity, and by changes in the English language, primarily driven by exposure to dialects of French. The sophistication of the author's literary style, and their references to pursuits such as heraldry and hunting, suggests a cultured audience. In their use of Latin, Purity, Patience, and Pearl show the poet's knowledge of the Vulgate Bible. In Pearl, the poet shows clear knowledge of not only the Apocalypse of St. John, but also many other parts of the Bible. It is possible that the poet consulted Latin commentaries on the Apocalypse and Genesis. The work makes use of major traditional elements in the Bible, such as treating Jonah's descent into the whale as a form of Christ's descent into Hell, and using Abraham's three angels as a type of the Trinity. What most interested the poet, however, was the literal sense of Biblical sources as opposed to their typological or allegorical significance. Pearl also shows the poet's understanding of mystical theology. It is pointed out that the Dreamer's definition of his vision as a 'gostly drem' (Line 790) indicates the poet's familiarity with the classification of visions used by mystical theologians and the mystics themselves. There is no need to suggest any extraordinary learning on the poet's part; most of the devotional writings were widely and easily understood. It is difficult to find evidence that the poet shared knowledge of classical poets, such as Virgil and Ovid, with the likes of Chaucer. 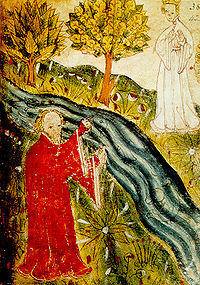 However, there have been claims that certain small debts can be detected in Sir Gawain and the Green Knight to Virgil and to Seneca the Younger, and it is highly likely that the poet was familiar with a wide range of Latin literature that was current among the educated class in the Middle Ages. The chronology of the "Alliterative Revival" of which these works are a significant part, cannot be established with any precision. It is assumed that the revival began in the south-west midlands and fully flowered in the late fourteenth century. While Cheshire monasteries were not as well endowed as those in the south-west midlands, they would have included the main Latin works used as sources by the alliterative poets. Dating the works written by the Gawain-poet is most problematic because the works could have been written as early as the 1360s or as late as the manuscript itself, which dates around 1400. It is assumed that the poet was alive during the mid-1370s to mid-1380s. The British Library MS Cotton Nero A.x. is the only surviving Middle English manuscript collection consisting solely of alliterative poems. There is firm consensus that the dialect of the scribe and the author localises the poem to the north-west Midlands, centring Cheshire. To present the historical background of Sir Gawain and the Green Knight and associated poems is ultimately a quest to find the anonymous poet. The notion that the Gawain-poet was attached to a provincial noble household, perhaps like that of Sir Bertilak, remains attractive to a number of critics. The quest for the Green Chapel brings Sir Gawain into Cheshire from Wales. Sir Robert Grosvenor, Sheriff of Chester was born circa 1342 at Hulme, Cheshire, England and is an appropriate reference-point in the investigation for the world of the poet. Grosvenor's manor house at Hulme is only a few miles north of the area pin-pointed by dialectologists, on the uplands associated with the Green Chapel mentioned in the poem. A number of scholars have proposed that Pearl was written to commemorate the daughter of John Hastings, Earl of Pembroke, and two of his clerks, John Prat and John Donne, have been advanced as possible candidates for authorship. A theory current in the early part of the 20th century held that a man called Huchoun ("little Hugh") may have authored the poems, having been credited with several works, including at least one known to be in the alliterative form, in the Chronicle of Andrew of Wyntoun. As Cotton Nero A.x contains the words "Hugo de" added in a later hand, its contents were identified with some of the works mentioned by Wyntoun. This argument, made in greatest detail by a Scottish antiquarian, George Neilson (who claimed that Hugh was a Scottish knight, Hugh of Eglington) is nowadays disregarded, mainly because the poems attributed to Hugh seem to have been composed in widely varying dialects. The surname of Massey, that of a prominent Cheshire family, is associated with St Erkenwald, a poem occasionally claimed to be another of the Pearl poet's works; the names of Thomas Massey and Elizabeth Booth (a member of the Booth family of Dunham Massey) are written in St Erkenwald's manuscript. In 1956 Ormerod Greenwood, working on a translation of Gawain, made the suggestion that the author of Pearl and Gawain was one of the Masseys of Sale. He suggested Hugh Massey, based on a number of puns he found incorporated in Pearl (in addition to the "Hugo de" inscription in Cotton Nero A.x) Given the obvious link through the name "Hugh", Hugh Massey has been conflated with Huchoun by some academics. A later suggestion is John Massey of Cotton; this was first put forward by Nolan and Farley-Hills in 1971. John Massey's authorship is further supported, according to Nolan, by one of Thomas Hoccleve's poems, in which the Hoccleve mentions "my maister Massy", indicating him to be a fearsome critic of poetic metre. The attribution to John Massey is not, however, widely supported by modern critics of the poem. Sir John Stanley (c. 1350–1414) has been suggested as a possible identity for the poet. He was a Knight of the Garter, and the presence of the Garter motto, Honi soit qui mal y pense is put forward in support. He was also familiar with hunting and armoury, as described in Gawain, and came from the appropriate part of England. Bennett (1979) suggested that Sir Gawain was written by an ancestor of the north-western landowner Humphrey Newton, who appears to have been familiar with the poem in the 16th century. Richard Newton, who wrote some surviving occasional verse in the late fourteenth century, was suggested as a candidate based on perceived stylistic similarities of his work to parts of Sir Gawain. The theory was not widely accepted. ^ a b Prior, Sandra Pierson (1994). The Pearl Poet Revisited. New York: Twayne. pp. 14–17. ISBN 0-8057-4516-5. ^ a b c Spearing, A. C. (1970). The Gawain-poet; a critical study. Cambridge [Eng. ]: University Press. ISBN 0-521-07851-2. ^ Breeze, Andrew (Spring 2004). "Sir John Stanley (c. 1350-1414) and the Gawain-Poet". Arthuriana. 14 (1): 15–30. doi:10.1353/art.2004.0032. Retrieved 29 March 2018. Pearl text & modern translation online William Graham Stanton – contains original text, literal translation, and poetic translation. Michael Twomey. "Travels with Sir Gawain". Retrieved 23 June 2007.